Most of us are familiar with dolphins, the charismatic marine mammal closely related to whales and porpoises. However, it is not common knowledge that nearly 40 species of dolphins exist with sizes ranging from the small four foot long Maui dolphin to the 30 foot long orca. Most of us are familiar with dolphins, the charismatic marine mammal closely related to whales and porpoises. However, it is not common knowledge that nearly 40 species of dolphins exist with sizes ranging from the small four foot long Maui dolphin to the 30 foot long orca. These playful creatures are found around the globe occupying shallower seas of the continental shelves. Dolphins are primarily carnivorous and enjoy a diet of fish and squid. They are incredibly intelligent animals displaying advanced behavior in the wild. They have been known to teach their young to use tools and sometimes cover their snouts with sponges to protect them while foraging. 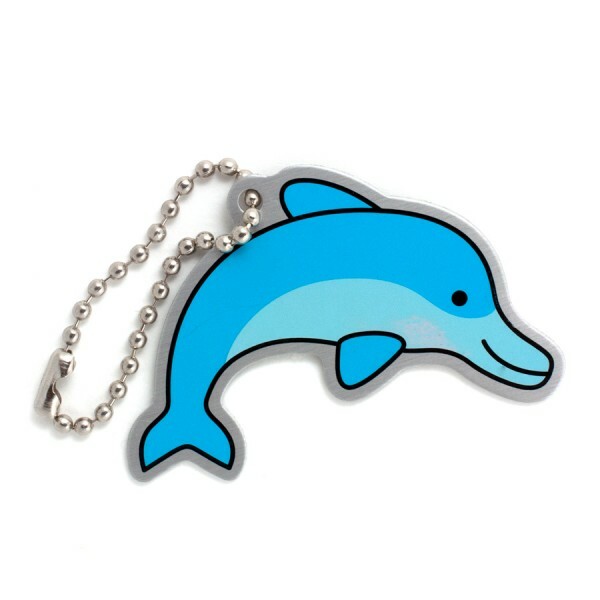 Throughout history, dolphins have had a close relationship with humans evident by appearances on ancient coins and art. Today they work with us in animal assisted therapy and are even used by some militaries for purposes such as finding mines or rescuing lost or trapped humans. This Travel Tag is fully trackable at Geocaching.com, each with a unique tracking number so you can follow their travels. Made of aluminum, just like travel bugs, these fun travelers also come with a chain so that it may be attached to another item. Leo the Lemur Travel Tag measures just under 2".